Modern three bedroom semi detached home with spacious living accommodation. The property comprises an entrance hall, sitting room, open plan kitchen diner, WC. First floor comprises of three bedrooms including master bedroom with en-suite shower room, and main bathroom. The property is situated over-looking a green area in a small cul de sac at the entrance to the development and has the benefit of a spacious front & rear garden. 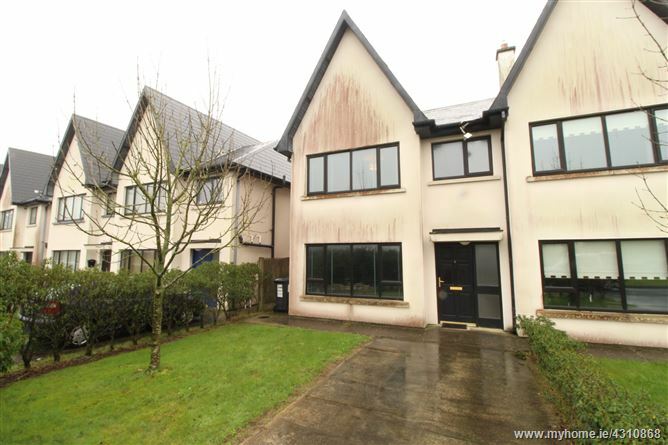 Located within the Carraig An Aird development at Six Cross in Waterford, the property is situated just off the outer ring road with easy access to all routes including the N25 Waterford to Cork road, and the M9 Motorway to Dublin via the new Southlink Bridge. The property is also within easy reach of Waterford IDA Industrial Estate, Waterford Institute of Technology, and the City Centre. Laminate wood flooring. open fire with oak surround & marble base. Venetian blinds to window. Tiled flooring. Fitted kitchen units with stainless oven and electric hob & tiled splashback. French doors from dining area to rear garden & Venetian blinds. Carpet flooring. Venetian blinds to window. Tiled flooring. WC. WHB & Shower. Tiled flooring. WC. WHB. Bath. Venetia blinds,tiled floor and walls to ceiling.